Going for simplicity and affordability, the Nokia C2-03 is good at the basics. It's a dual-SIM by trade and Touch and type by name. A curious combination, whose success is by no means guaranteed. The C2-03 uses two tested recipes but the meal is not for traditional eaters. A S40-powered feature phone, the C2-03 stays within budget. Familiarity is its main advantage. Yes, it's a cut above the typical entry-level handset but not in an arrogant way. The target is returning Nokia customers, who are willing to upgrade without breaking the bank. Those that aren't much into experimenting. The ones that would like to give touchscreen a try but wouldn't sacrifice a proper keypad. Texting is still important - life style and budget-wise. Now, you can certainly get a better user experience elsewhere. There's no shortage of cheap touchscreen dumbphones and entry level smartphones are an increasingly popular option. It seems to us though the Nokia C2-03 need not fear competition. For one, the combination of touchscreen, keypad and dual SIM is hard to match. But more importantly, it will target users in markets dominated by the Finns. It's not to say the competition is completely non-existent. Samsung has quite a few dual SIM alternatives to offer. The Star II DUOS and the Ch@t 222 fit the touchscreen bill too. The Star II Duos boasts a larger display of higher resolution and the much friendlier capacitive technology. It clearly has superior features and user experience but comes with a price tag of around $200. The Ch@t 222 is about as basic a phone as it gets but does have the dual-SIM standby functions of the C2-03 and a full QWERTY keyboard, which is much more capable than the Nokia C2-03's numpad. But it, too, costs more. 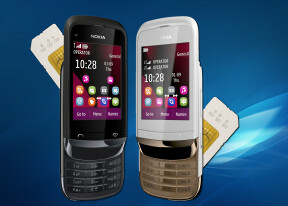 You know, if you want dual SIM for less you have little choice than go Nokia. Samsung do have basic dual SIM solutions but rarely do they go as low as the Nokia X1-01. The Nokia C2-03 is a natural step up from the likes of the X1-01 and the C2-00. It brings a touchscreen and a keypad and a solid dual SIM solution but it doesn't get complicated. It does the job, fits the budget and helps users minimize costs. Touch and type meets save as you go.